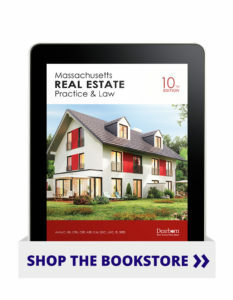 This supplemental text covers Massachusetts real estate license law and regulation. It is designed to be used with our national prelicensing texts for complete preparation for the state licensing exam. This text includes answer key rationales to provide a more comprehensive learning experience for the student that highlights essential state-specific concepts. The short, focused chapters make essential information easy to grasp for new students and serve as a great refresher or reference material for practitioners. Instructor Resources include outlines by unit and a 100-question final exam.